Model: Model: Fulgurex's model of the Be4/4 is stunning. They are handmade out of brass with extensive detail. 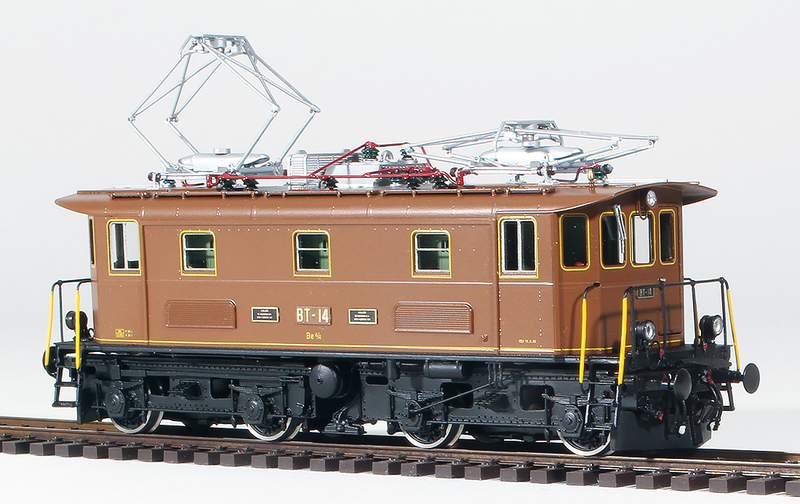 Model features a full cab interior with illumination, sprung loaded puffers, directional lighting, very detailed pantographs and extensive exterior details. Models are equipped with ESU lokpilot decoder and a high efficiency "Faulhaber" type brushless ironless motor. The brown version of the Be4/4 is extremely limited only 25 were produced worldwide. 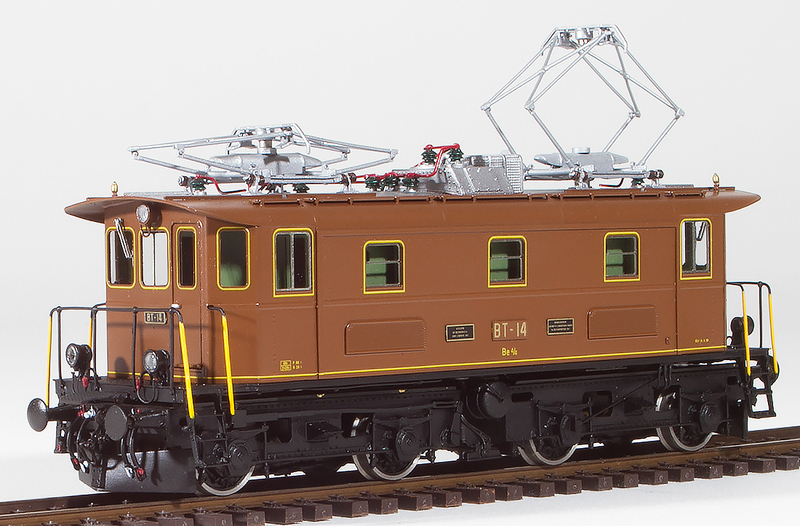 We believe they would make a nice addition to any collection, especially for the collectors that love old box cab traction electric locomotives. Prototype: On the occasion of its electrification, the Bodensee-Toggenburg-Bahn (BT) procured in 1930 six locomotives of the type Be 4/4 and two railcars BCFe 2/4 . The motor coaches were related in the electrical part with the Be 4/4 and had the same drive motors. The locomotives were ordered from the Ateliers de Sécheron (SAAS) in Geneva, which built the electric part and supplied its spring drive. The mechanical part came from the Swiss locomotive and machine factory in Winterthur. The Be 4/4 was designed on the model of the BBÖ 1170 and the BBÖ 1170.1, with which one had already had good experiences in Austria. Shortly thereafter, the Emmentalbahn (EB) and Solothurn-Münster-Bahn (SMB) were electrified, and the Burgdorf-Thun-Bahn (BTB) switched its operation from three-phase to 16? Hz single-phase alternating current. In this connection, the three railway companies procured in 1932/33 eight locomotives Be 4/4 and twelve railcars CFe 2/4. The locomotives essentially corresponded to the machines of BT. The railcars had half the power of a Be 4/4 since only one bogie was motorized. The essential parts of the electrical equipment but agreed with the Be 4/4. The Emmental-Burgdorf-Thun-Bahn (EBT), originating from the merger of EB and BTB, was very satisfied with the Be 4/4 and ordered one machine each in 1944 and 1953. The second replica received instead of the oil main switch a compressed air main switch. The Be 4/4 was built according to a very modern concept for the time. They were the first standard-gauge bogie locomotives with single-axle drive in Switzerland. The axle-less locomotive with the axle sequence B 0 'B 0 ' has two bogies. Each wheelset is individually driven by a Sécheron hollow shaft spring drive, a refinement of the Westinghouse spring drive. The four traction motors are fully housed in the two bogies. The electrical equipment was designed for a journey from Romanshorn to Rapperswil and back with a trailer load of 250 tonnes. The locomotives with hops control have an hourly output of around 1200 kW (1600 hp ). With a service weight of 66 tonnes and a maximum speed of 80 km / h, they are well suited for secondary tracks with a light superstructure. The locomotives were used in passenger and freight transport and from 1944 in express trains on the so-called direct line . When the electric operation on the Südostbahn (SOB) started, the BT helped with two Be 4/4 and one BCFe 2/4, because the ordered vehicles were not yet available. For use on the SOB 50 ‰ ramps, the Be 4/4 were retrofitted with a recuperation brake between 1945 and 1947. At the same time, automatic train protection and a new safety control system were installed. From 1952, the bogies were strengthened and set up a driver's cab for sedentary service. Although the top speed of 80 km / h on the section Wattwil - Rapperswil was barely sufficient, the Be 4/4 still proved itself in all train categories on SBB and SOB routes. It was decided in 1966 to rewire the locomotives, to set up the second driver's seat for seated operation and to install a multiple control system. This allowed the Be 4/4 to replace a BDe 2/4 drive car for revisions. After delivery of the high-performance railcars, the mission focused on the region of St. Gallen and Toggenburg. With the new acquisition of the RBDe 4/4 Vorortstriebzüge and the Re 4/4 91-96 the locomotives with their characteristic platforms were supernumerary, but still provided shunting services for years and were called in for special services.